Bossier Parish Community College is proud to announce its Nursing Program’s fall 2017 numbers. 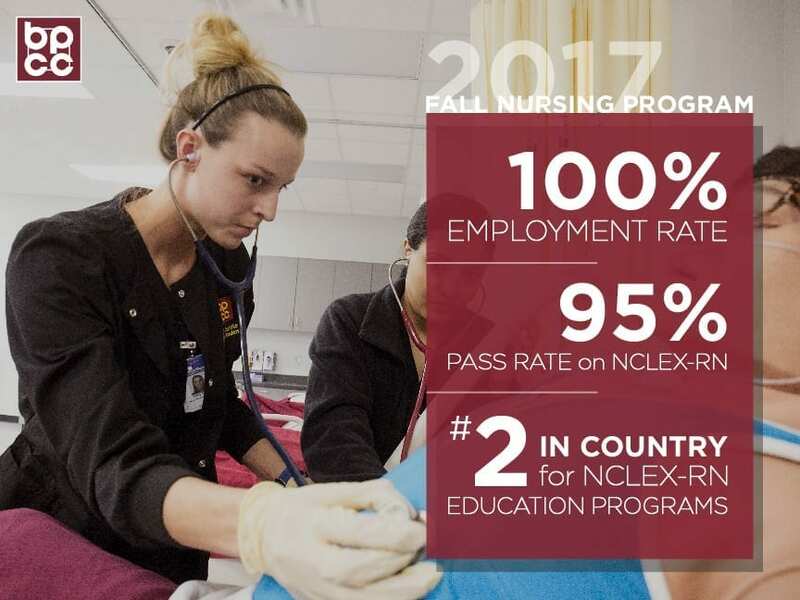 The BPCC Nursing Program has a 100 percent employment rate for fall 2017 graduates and a National Council Licensure Examination-RN pass rate of 95.89 percent for fall 2017 graduates. The program is also second place in the United States for 2017 in NCLEX-RN education programs with a score of 92.93 percent, which is 5.08 percent above the national average of 87.85 percent. The NCLEX is an examination for the licensing of nurses in the United States. NCLEX examinations are developed and owned by the National Council of State Boards of Nursing, Inc. (NCSBN). NCSBN administers these examinations on behalf of its member boards which consist of the boards of nursing in the 50 states, the District of Columbia, and four U.S. territories. NCLEX examinations are designed to test the knowledge, skills and abilities essential to the safe and effective practice of nursing at the entry-level. In 2010, Bossier Parish Community College received approval from the Louisiana State Board of Nursing and the Board of Regents to offer the Associate of Science Degree in Nursing. Since that time, many students have declared nursing as their major course of study. There were 24 nursing graduates in the fall 2017 class. For more information on the BPCC Nursing Program, contact the Division of Science, Nursing, and Allied Health at (318) 678-6080. For more information on NCLEX, visit the National Council of State Boards of Nursing at www.ncsbn.org.